Step 5: Open your Internet browser (Internet Explorer/Firefox) and enter http://192.168.0.1 into the address bar. 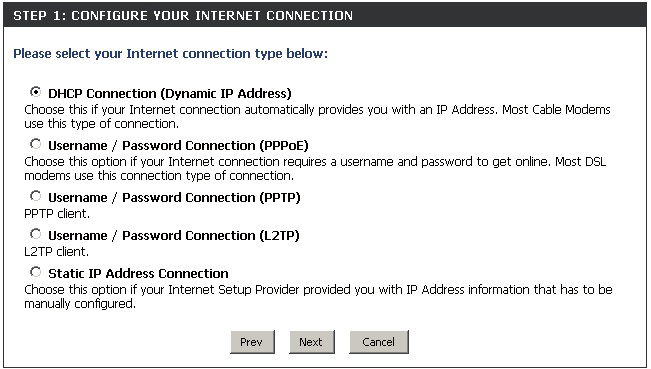 Step 6: You should be prompted with the D-Link Quick Router Setup Wizard, Click Next to Begin. Note: This wizard will only appear at the first configuration. If your router has been configured previously, you will need to reset it to go through the setup. The Router will perform a scan to determine the type of internet service you have. If successful, the Internet Setup will be skipped. Next is your Wireless Settings. Enter a New Wireless Network Name and Password. This password is what you will need when connecting to your wireless signal for the first time. Enter a password for your router. This password is needed when you want to log into the router configuration setup page. A summary of your wireless settings is displayed. This includes your wireless network name and your wireless password. The router will now reboot to apply your new settings and the setup is complete.